Is there anything more deliciously and naturally refreshing than a perfectly sweet, juicy, ripe orange? I eat citrus every day when it’s in season, but I never get tired of it. And since oranges are low in calories and high in fiber while also being loaded with vitamins, they’re a completely guilt-free treat. Of course, as we all know, oranges can also be juiced for use on the breakfast table, in smoothies, or in thousands of different beverages, alcoholic or otherwise. And oranges are so enjoyable to cook and bake with, in sweet and savory applications. From breakfast to dessert, the recipes just keep coming. But have you ever stopped to consider that the outside of the orange has tens, even hundreds of amazing uses, too? 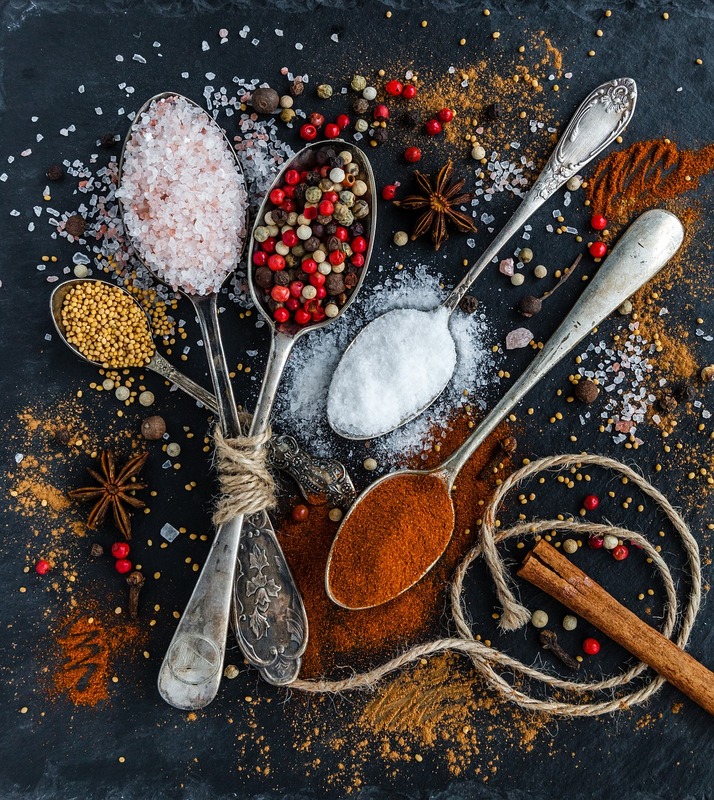 You may be quite familiar with the inclusion of grated peel in recipes, including cookies, scones, and cakes, and savory dishes like chicken, roasted veggies, and more. But things definitely don’t stop there. Far from being just something to throw away or compost, the fragrant, beautiful exterior of these citrus fruits, rich with the heady fragrance of orange oils, has so many incredible applications. Curious? Check out these 25 ways to use an orange peel--we’ve got beauty products, home fragrances, seasonings, cleansers, liquors, and so much more. Enjoy a sweet-smelling scented sachet, made with dried citrus peel. Lovely to tuck away in a drawer or closet. Keep your skin soft with a citrus sea salt scrub. This is so incredibly fast to put together—just 10 minutes and a few very common ingredients—and it smells and feels amazing. 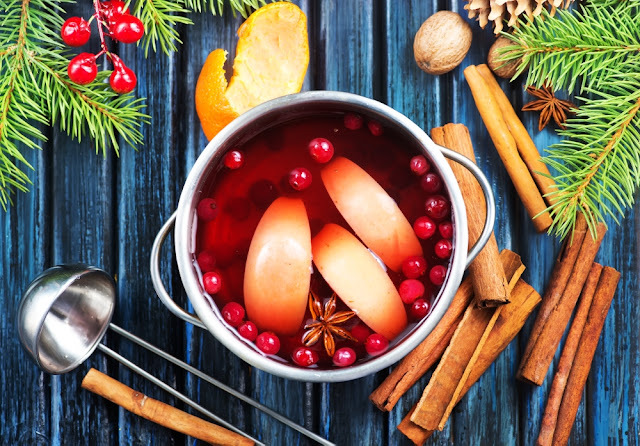 Drink and be merry with homemade mulling spices including dried orange peel. This is a really easy and fun little gift to whip up. They can be added to either cider or wine. 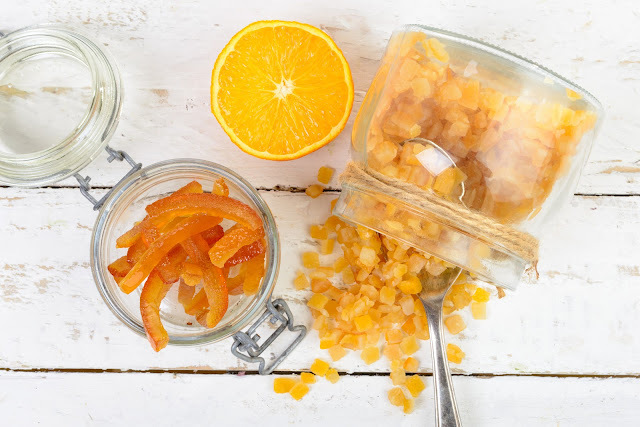 Make your own fragrant orange sugar or orange finishing salt after starting with dried peels. A gourmet touch from such basic ingredients. DIY yourself some super-simple orange vodka and then follow up with some homemade, wallet-friendly orange liqueur. While you’re at it, why not create some of these adorable orange peel drink garnishes? Now that’s a snazzy cocktail. Make this luscious orange body butter and treat yourself. Looks almost good enough to eat! Of course, candy your citrus peels! Almost everyone loves this sparkly, bright-flavored treat, and they look impressive too. Give your whole house a warm, sweet fragrance with a quick orange-scented simmer pot. Great if you need to usher a lingering strong smell out of your home. 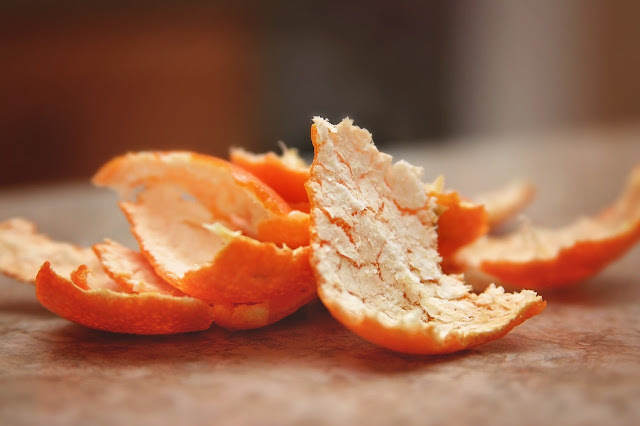 Run a few chopped up orange peels through your garbage disposal with a couple of ice cubes to freshen things up and sharpen the blades. Serve lemon or orange sorbet in halved peel “bowls” for a beautifully refreshing summer treat. Stamp holiday shapes out of the peel using cookie cutters. Then dry them in the oven or at room temperature, and make adorable holiday garlands, ornaments, and gift tags. Jazz up potpourri and centerpieces with these gorgeous dried orange peel roses. There’s a bit of a knack to it (we’ve made a few), but they’re fun to do! Refresh and moisturize your ovely face with an orange-honey-oat face mask, made with dried orange peel and fresh juice. Create your own orange extract. It’s almost embarrassingly easy, and so much cheaper. Go a step further, if you like, and make your own orange essential oil—super useful for soaps, lotions, and bath goodies. It’s quite simple and mainly requires time. Harness the power of citrus to make this incredible citrus cleaner using safe and natural ingredients. Leave a bit of orange peel in your brown sugar container to keep the sugar from “bricking up” on you. Use empty orange or tangerine halves to make candles by scooping out the fruit and filling the halves with olive oil. How neat is that? 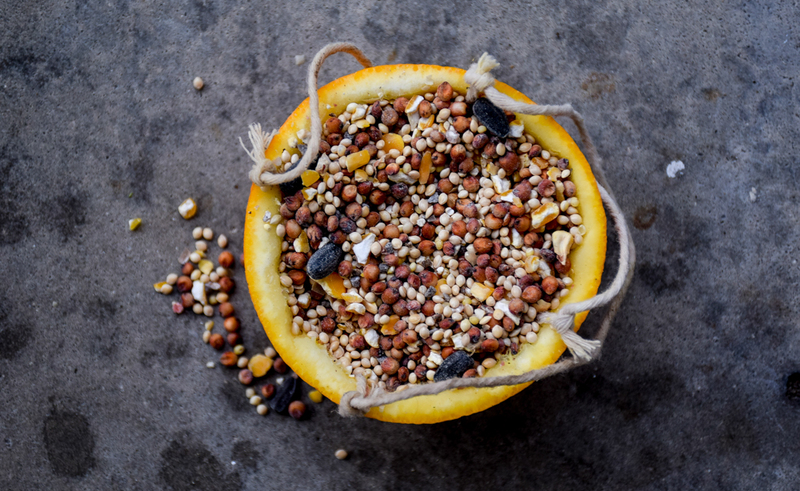 Bake chocolate cake, cinnamon rolls, or other goodies in empty halved orange peels over a campfire for a delicious treat with nothing to wash.
Use empty orange peels as quick, temporary birdfeeders. A fun project to do together with kids. Make an easy and natural orange air freshener spray to have on hand to keep your home smelling sweet without all the chemicals. Start your campfire, fire pit fire, or fireplace fire with these super-simple dried orange peel fire starters. Effective and fragrant! Make these beautiful all-natural “sprinkles” out of dehydrated orange peel, lemon and lime peel, and raspberries! Wouldn’t this be great for a child with dye allergies? Wow, what an amazing list! But believe it or not, we’ve just scratched (or should that be “peeled”?) the surface here. For more awesome DIY ideas using citrus, along with recipe boards, gift ideas, vintage Florida citrus history, and more, visit our new Pinterest page! You love oranges, right? Of course…we all do. Juicy, brightly colored, and...sour? Well, until just a few hundred years ago, that’s what oranges were! The world’s “original” eating orange, thought by many to be native to Asia, was the bitter or “sour” orange. These fruit are also today known as Seville oranges, after a city in Spain where they have long been famously grown. While a sour orange may not at first sound highly appealing to some of us today, the fruit was highly valued in that form. 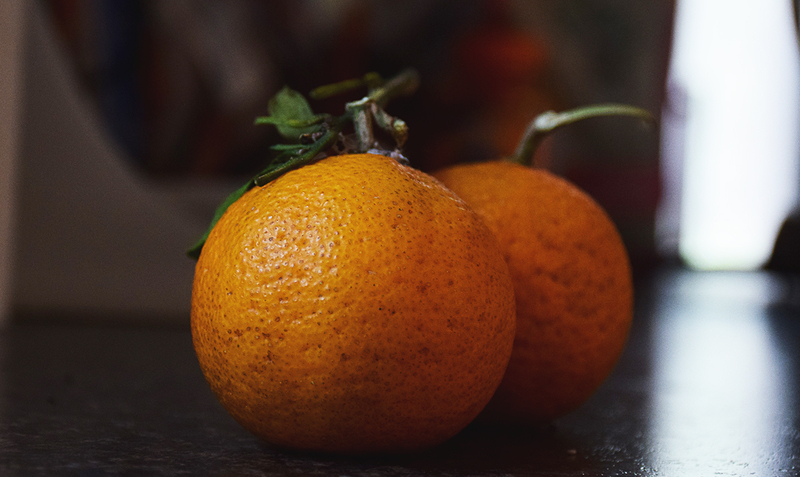 In fact, this type of orange has been and still is incredibly popular and an amazing world traveler, making appearances in a vast variety of fascinating and complex dishes around the globe. Many say that when it comes to cooking, the depth of its flavor simply can’t be matched by sweet oranges. Those of us in British-influenced counties may know the Seville or sour orange best for its traditional use in marmalade. 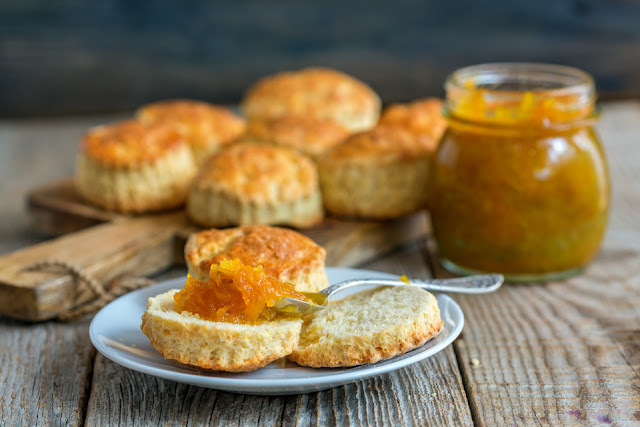 This beautiful orange-amber preserve goes back to the late 1600s and is traditionally eaten not just at breakfast with scones, crumpets, and toast, but at teatime and even dinner, with meats. Marmalade is made from the peel of the orange and is rather bittersweet, but this is part of its allure. The Seville is highly preferred for this preserve due to its superior flavor and high pectin content (the pectin is what makes the jam set). By the way, marmalade is not the only way bitter oranges are used in a preserve! In Iran, the beautiful fragrant blossoms of the fruit are used to make a special jam, which must be wonderfully aromatic. Here is a recipe for this fascinating jam! The sour orange has also often been preserved in other ways. For instance, in Greece, the Middle East, and Russia, they are preserved in sugar syrup in a treat known as spoon sweets. In India, sour oranges are pickled in salt and eaten as a condiment alongside savory dishes, such as yogurt rice. Seville or sour oranges also have a rich history of use in meat or poultry marinades. This use is amazingly international, spanning Iran, India, South and Central America, and the Caribbean. Mojo Criollo, a Cuban citrus marinade and dressing, is very popular on meats and salads in South Florida, especially the Miami area. It absolutely relies on sour oranges (along with garlic, spices, and olive oil) for its authentic flavor. Here’s a Mojo Turkey recipe, or try this one for mojo shrimp—delicious. Sour orange also goes beautifully with fish. Finally, it has often been used for desserts. (This isn’t strange, when you think about it…consider how much we love lemon in sweets!) 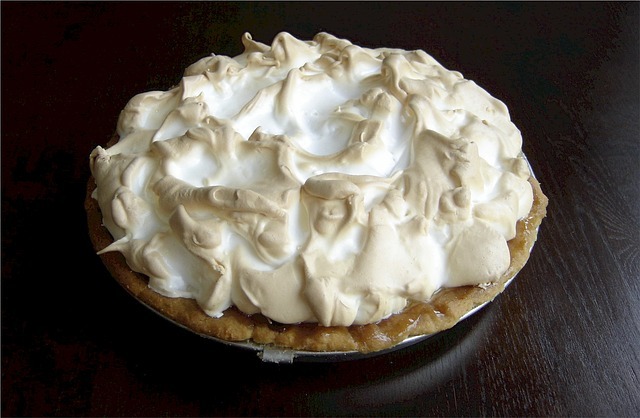 Sour orange pie is quite traditional in the southern United States, and Seville orange tart and cake are also popular among those with an affinity for this fruit. In Sweden and Finland, sour orange peel is used to flavor gingerbread and an unusual and ancient Finnish treat called Mammi, made of rye flour, malted rye powder, seasoned salt, and orange peel. We hope we’ve piqued your curiosity a bit and gotten you to ponder the importance and mystique of this very ancient fruit. If you think you’d like to try the rather rare and special Seville, you may find them at your local grocery if you’re lucky—or, you can order a box from Florida Fruit Shippers.